I love to bake... a little too much and the problem is I'll bake and then not want to waste it so.....Eric and I end up in an eating competition and we just eat way too many sweets if they're in the house.....the struggle y'all....I mean it's bad! Sweets (ice cream, cake, etc.) does not last longer than two days in our house so we usually just try to not have them in the house period. With that TMI in mind, I do love any excuse I have to bake and try new recipes. 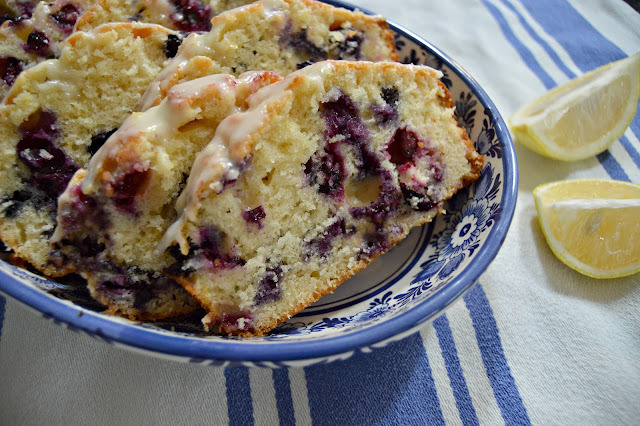 We recently went to a BBQ (on the 4th actually) and I made this Blueberry Lemon Glaze Cake. Y'all....AMAZING!! If you like citrus at all you'll love this. 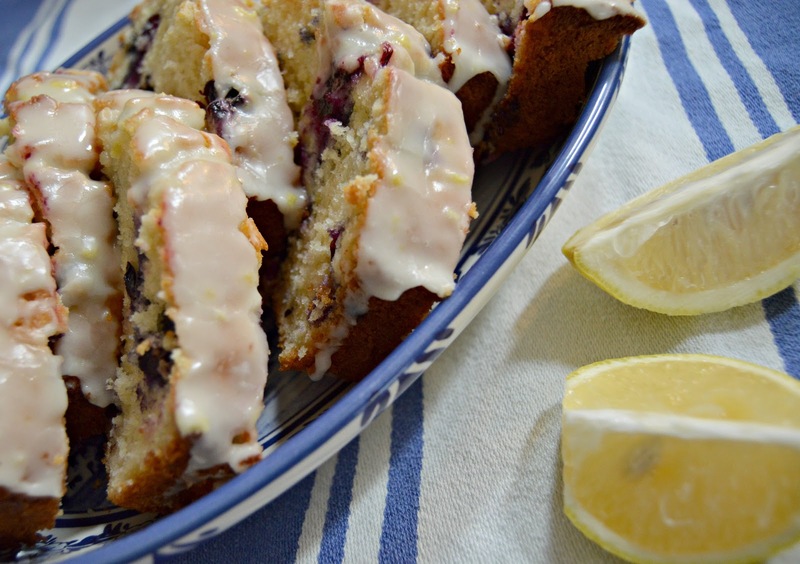 What I liked the most is the cake itself is mostly blueberry with a very subtle hint of lemon but the lemon glaze on top packs a punch which just balances the whole cake out. I got this recipe from one of my all time favorite cook books The Gathering of Friends Vol. 6 (page 20). The printable recipe is below for your convenience. I have 4 or 5 of these cookbooks and what I love so much about them is it's not just recipes. It is the whole hosting setup. She shows you how she prepares each tablescape and will give little decorating tips along with the recipes. Just a great gift for your favorite hostess! Check out their full website here. Preheat oven to 350 degrees. Spray an 8X4 loaf pan with cooking spray. In a medium mixing bowl, combine flour, baking powder, salt, and 1 tbsp. lemon zest. Remove 1 tbsp. of the flour mixture and set aside. In another bowl, toss blueberries with the 1 tbsp flour mixture you set aside. In a separate bowl, with an electric mixer, beat the softened butter and sugar together until creamy. Fold in eggs one at a time then add vanilla and milk just until combined. Add dry ingredients to liquids. Mix only until combined. Gently fold in coated blueberries. Place batter in the 8 X 4 loaf pan and bake for 55 to 65 minutes or until cake is golden and toothpick inserted in the center comes out clean. (Tip: start with 55 then increase as needed) Lemon Glaze Stir powdered sugar, zest of one lemon, and lemon juice in a small bowl and blend well. Pour over cooled cake and serve.